In 2015, I read Alexandra Monir’s Suspicion and was pleasantly surprised. The book had a Rebecca-esque gothic feel that immediately transported me. 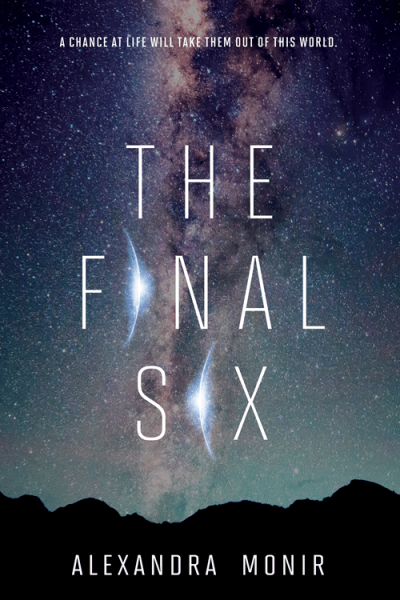 Alexandra’s latest book, The Final Six, again transports readers, but to a completely different place. The Final Six isn’t a gothic novel, but Alexandra’s writing definitely evokes a mood and sense of place. Her opening chapter with Leo swimming around what is left of Rome has such a sense of longing an isolation that you can almost hear the water lapping against the ruins. When you meet Naomi, there’s more of a sense of normalcy. When the 24 teenagers come together, those dichotomies crash, creating a built-in dynamic that works well with the overall plot. The Final Six is an engrossing read. Alexandra’s pacing is strong and her ability to leave space for reading between the lines is commendable. It’s a book I didn’t want to stop reading and one I didn’t want to end. The book isn’t perfect. The ending leaves a lot of unanswered questions — probably because more books are coming. There are a few convenient twists, but nothing that really distracts from the overall book. Sony Pictures has already optioned The Final Six, and it’s easy to see why. It’s a dystopian adventure that seems plausible.